Foxglove Summer in the fifth installment in the stunning Rivers of London series by Ben Aaronovitch. After the stunning climax of Broken Homes, (seriously if you haven't read Broken Homes read it first) Foxglove Summer feels like a fresh summer breeze. Peter Grant escapes the rat race of London to the slower pace of the English countryside. A small village in Herefordshire needs the singular skills of Peter's department following the disappearance of children in "unusual" circumstances. Initially I was a bit annoyed that we didn't immediately jump into dealing with the aftermath of Broken Homes, however it does soon become clear that the authors approach was the right one. By not going down that road too early we get to feel as Grant does, a little lost and trying to forget it happened while secretly wanting to know more. I loved the change of style this trip to the country brings, the author does a terrific job of creating a rural ambience including some larger than life country folk. The story itself isn't as fast-paced or as complex as the previous books however this does allow some room for developments in Grants character and personal relationships - most notably with a certain water-spirit (not before time I might add). It's a credit to the author that the series feels as fresh as it did in Rivers of London and that there still seems so much more to learn. We do eventually hear from the one person anyone who has read Broken Homes will be thinking about and the course of THAT journey is quite unexpected. 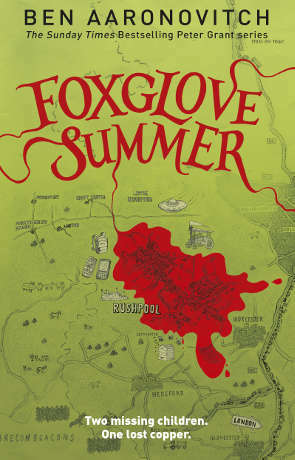 Foxglove Summer is another rewarding chapter in the rich and vibrant Rivers of London series, which has already become one of THE urban-fantasy stories not to miss. Written on 5th January 2015 by Ant.